A larger Columbian Catfish about 2 years old is shown with younger conspecifics and other much smaller fish. A male Ancistrus cirrhosis guarding fry. Shows a typical cirrhosis with the characteristic bristles on snout. Emerald Green Cory, Corydoras splendens are a lively fish that can be kept in a community aquarium. This looks to be a perfect aquarium environment for this Featherfin catfish. Notice the lower light levels, hiding places, and algae growing from the wood which comes from a long established tank. What lively and curious catfish! Catfish are so named, because of their barbels look a lot like cat whiskers! Catfish can be found in every ecological niche. They are found all over the world, though primarily in fresh water, with the exception of Antarctica. There are some that live in the oceans, though the few catfish that do live in seawater are thought to spawn in brackish water. They are members of a huge order of fish called the the Siluriformes, or ray-finned fish, and there are over 2400 catfish varieties. Catfish and humans have a very long history. People have fished and farmed them as a food source for hundreds of years in Africa, Asia, Europe, and North America. They are also popular in the aquarium hobby. They are enjoyed for their unique appearance but also as helpful scavengers to clean up left over foods. Catfish are generally very hardy and easy to keep. Most are also nocturnal, becoming active at night, so they must be fed in the evening hours. Their eyes are small but they are aided in navigation and feeding by chemoreceptors all across their bodies which allow them to taste and smell anything that is in the water or that they touch. Their feeding habits range from plant-eaters and detritivores (those that scavenge on dead matter), to predators. Make sure they are eating since it's hard to tell with many of the armored catfish if they are losing weight. Be careful when handling catfish since all species have strong, rigid spines on their dorsal and pectoral fins. These spines can pierce the skin and many species have "stings", though most stings are non-venomous. The species list below includes popular catfish varieties as well lesser known species. Each fish guide has in-depth information including their places of origin, habitats and behaviors as well as the fish care needed for successfully keeping them in the aquarium. Catfish pictures are also provided within each fish guide to help with identification, and to aid in choosing pet fish. Corydoras are ideal for every type of aquarist as they are very peaceful and very hardy! These fish are very active during the day, always bobbing around and eating all manner of food from the bottom of the aquarium, keeping it clean with their scavenging! There are over 180 species of Corydoras known to icthyologists, about 50 are available to the hobby and about 10 are bred commercially. They are found in every river in South America, each with its' own distinct species and subspecies. Most of the fish in the Callichthyidae family require access to the air. They will often swim rapidly to the surface of the water for a gulp of air. This air is a supplement to their gills that is then utilized by being absorbed in their lower digestive tract. Coryadoras always swim in schools of dozens of fish, sometimes they even swim with other species. As their name implies, these fish are shaped like a banjo. 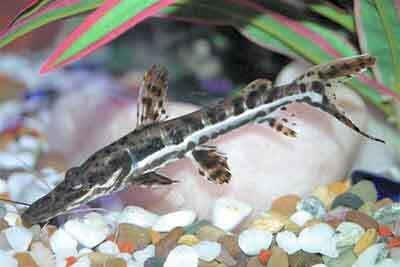 Banjo Catfish will often seem to be dormant as they don't move around very much. They are often a burrowing fish so a finer sand is appreciated. The attractive catfishes in the family Pimelodidae have been prized by collectors because of the great diversity in both size and patterning! The Flat-nosed Catfish, or Antenna Catfish have extremely long adipose fins, some as long as a third of their length, and their "whiskers" or barbels are also unusually long. Though they are mostly peaceful, these catfish have large mouths and can swallow a good sized fish. Be careful that the tankmates you choose are not much smaller than your catfish! The Pangasius Catfish or Iridescent Shark Catfish is sometimes thought of as a pelagic fish. Pelagic catfish are diurnal (active during the day), swim in the middle of the aquarium, and prefer to live in schools. They are found in clean fast moving waters, thus in the aquarium they need good water movement and frequent water changes. The family Ariidae has some pretty large fish, the Silver-tipped Shark for example, can reach up to two feet! Some species of Shark Catfish or Sea Catfish are used as a food fish, and are considered quite good eating by the natives where they are harvested. Fishes with suckermouths have some special features that other fish don't have! These types of catfish have extra slits behind the head to breathe through. This frees up their mouths for for more important duties such as feeding and clinging to surfaces. They also have an unusual eye feature, an eye flap. This is a flap of skin that protrudes from each eye, allowing them to alter the amount of light that reaches their eyes. "Naked Catfish" describes the body armor of this group of fish. They have none! The Synodontis catfishes do not have scales, scutes or or any other kind of body protection, thus they are also known as "Naked Catfish". Being some of the most vocal catfish they are also dubbed "Squeaker Catfish". Contrary to popular belief, most Synodontus catfishes do not swim upside down. But these fish were originally made famous for the first-kept member of the Synodontis genus, the Upside-Down Catfish, Synodontis nigriventis! This is not the prettiest member of the group, but it is intriguing because of its habit of swimming upside down. Note: In his book "AQUARIUM ATLAS, Volume 2", author Hans M. Baensch states that most of the Synodontis Catfish have not been bred in captivity, with the exception of the Upside-Down Catfish, S. nigriventis and possibly the Black Synodontis, S. nigrita. He states that nutrition is very important for the breeding of the Synodontis species and that some of the nutritional substances they get from their natural diet, notably snails and insect larvae, which may not be readily available as fish foods. Be careful when catching Thorny Catfish. A prick from the spines of this fish is quite painful! Thorny Catfish have a strong first spine on their pectoral fins, which can be used as a defensive weapon. They tend to stick out these side spines a a very rigid manner, especially when stressed. Catfish belong to a large group of Carp-like fishes, all of which can be recognized by their characteristic pairs of barbels. These whiskered fish can have up to four pairs of barbels, though there are fewer on some species. Barbels are located on the nose, each side of the mouth, and on the chin. The Pimelodidae family, known as the Long-Whiskered catfish, have some of the most extended barbels while the Bushy Nose or Bristle-nose Catfish of the Loricaridae family have a more bush-like appearance. The body shape of most catfish is cylindrical with a flattened belly. They have a large head, small eyes, and a mouth that has no teeth. The mouth can extend outward to feed through suction and gulping actions rather than biting and cutting, especially noticable on plecos and other suckermouth catfish. Due to their heavy bony head and a reduced gas bladder, they also tend to sink. All these characteristics allow them easy access to detritus, plant matter and other organisms found on the bottoms of rivers, lakes, and streams. Many catfish species have a maximum length of under 5 inches (12.7 cm), yet this vast group of fishes is one of the most diverse in size. On the small side are tiny Aspredinidae, which are Banjo Catfish from South American like Hoplomyzon papillatus which reaches less than .79 of inch (2 cm). There are also the miniaturized Trichomycteridae, the Pencil or parasitic catfishes that grow to about an inch (2.6 cm). The well-known Oto Catfish too have some very small members like Otocinclus tapirape which is the smallest of this genus, reaching just over an inch (2.4 cm). On the other side of the size spectrum are huge monster catfish. The largest catfish are both heavy and long. The Mekong Giant Catfish Pangasianodon gigas from Southeast Asia can reach up to 10.5 feet (3.2 m). A Mekong netted in northern Thailand on May 1, 2005 weighed 650 pounds (293 kg), becoming the world record catfish. The longest catfish is the Giant Pangasius or Chao Phraya Giant Catfish Pangasius sanitwongsei, reaching almost 12 feet (3.7 m) in length, followed by the Wels Catfish Siluris glanis of Eurasia, reaching up to 9.8 feet (3 m). Along with other Carp-like fish and Characins, catfish have a "Webers apparatus".The Weberian apparatus is a body structure that connects the swim bladder to the auditory system. This apparatus facilitates sound transmission from the swimbladder to the inner ear to increase hearing sensitivity. Catfish can produce sound by abduction of their pectoral fins, making a squeaking sound by by rubbing the spines of the pectoral fins into grooves on the shoulders. They use this sound as a warning to both predators and competitors during spawning time. Sound production is especially noticeable in Talking catfish of the Doradidae family and in the Mochokidae family of Squeaker Catfish. Catfish are different from most other fish since they don't have scales. Some are protected by skin that is covered in bony plates called scutes. Those with scutes include the well-known Corydoras. These are armored catfish of the family Callichthyidae that have two rows of plates along the length of the body. Others have armor formed from expanding vertebrata elements that create bony plates. Most Catfish are not dangerous to humans, yet a few species can cause some concern. The tiny parasitic catfish known as Candiru from the Trichomycteridae family, also called the Toothpick fish or Vampire fish, have a been said to enter and paralyze the urethra, though there is only one case ever documented. With the exception of the Electric catfish (Malapteruridae), all of these ray-finned fish are protected by strong hollow bony spines extending from the dorsal and pectoral fins. When they feel threatened they extend these fins outward and lock them. These strong bony spines can inflict a severe and painful wound, and in several species these fin rays can deliver a stinging protein. This protein is so strong in catfish in the Plotosidae family Plotosidae and the Heteropneustes genus that a human inflicted may need hospitalization. In the case of the species Plotosus lineatus, the stings could result in death. Legend has it that one catfish, the giant Manguruyu known as the Gilded catfish, Jau Catfish, and Giant Jelly Catfish Zungaro zungaro (syns: Paulicea lutkeni, Paulicea luetkeni), can reach 3 meters in length and has been held responsible for eating small children in such rivers as the Rio Branco in the Amazon basin. A number of fatal attacks between 1998 and 2007 on the Kali River in India and Nepal were alleged to have been by the Goonch catfish Bagarius yarrelli, also called the Killer Catfish. The Goonch was investigated by British biologist Jeremy Wade, but no final conclusions on the truth of these attacks were drawn. The large Wels catfish has also been said to kill small children, but again there is no documented cases. However adults of this species have been known, on extremely rare occasions, to cause some severe injuries. Those catfish that are predatory will eat smaller fish. Make sure you have appropriate sized tank mates as they will readily consume other fish if they are less than about half their own size.